This sculpture is a copy of part of a monumental relief sculpture on the Arch of Triumph in Paris. It is called The Departure of the Volunteers of 1792, and is also known as The Marseillaise. Rude created this sculpture to symbolize the gathering together of the French people in defense of their country. 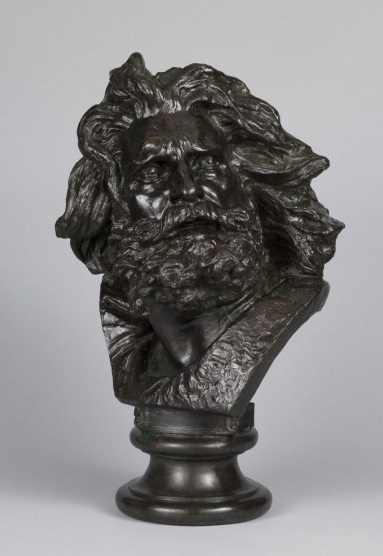 The man’s thick beard shows his maturity, and the wind blowing through his long hair makes the sculpture more dynamic. France had just endured another civil revolt, that of the July Revolution of 1830, which ended the Bourbon dynasty. The Arch of Triumph had been commissioned by Napoleon in 1806, to commemorate his military victories, but the work still continued until 1835. Napoleon had finally lost all power in 1815, and so the images of heroism in the sculpture do not refer directly to the Emperor, but rather to soldiers of antiquity who are being led by the allegorical character of Victory. Romanticism was a movement that began near the end of the 18th century and had its strongest impact in the 19th century. The image sometimes told a familiar story from literature, and the word "romantic" derives from the word "roman" in French, meaning "novel" in English, a literary work of fiction. In romantic sculpture, artists sought to engage the viewer’s emotions with dramatic effects of facial expression and movement. François Rude (1784-1855) was born in Dijon. He studied at the National School of Fine Arts in Paris, and received the Rome Prize in 1812. The sculpture of The Departure of the Volunteers is his most important work. The French government issued a ten-franc coin in honor of François Rude in 1984, to commemorate the bicentennial of his birth. This site is a project of the University of Missouri-St. Louis with assistance from the Saint Louis Art Museum. Support has been generously provided by the Cultural Service at the Consulate General of France in Chicago.